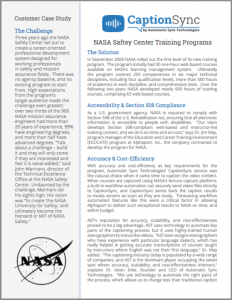 Whether your video content consists of public announcements, employee communications, training, or other important messages, closed captioning solutions for government need to be high quality to be compliant with ADA and Section 508 accessibility regulations. The benefits of providing captioning to your audience are undeniable. However, it often is not easy to find captioning solutions that have the quality needed to meet the intent of the statutes, which is to provide equally effective access to all content. CaptionSync by Automatic Sync provides a cost-effective, fast and easy process to caption videos while meeting the highest quality standards. Our professional transcribers are well versed in the laws and requirements, allowing them to provide captions with a 99%+ accuracy rate that meets the regulation requirements. Also note that transcription and captioning services from Automatic Sync can be contracted under the GSA Schedule. 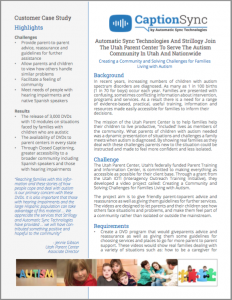 Automatic Sync Joins Utah Parent Center to Serve The Autism Community. 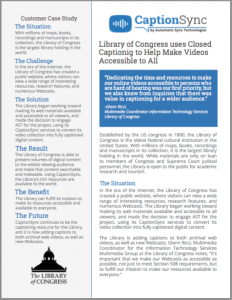 Library of Congress Uses Captioning to Make Videos Accessible to All. Closed Captioning of NASA Training Program Videos.